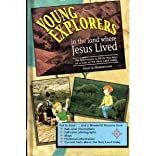 Two boys better understand God's Word and the teachings of Jesus through an introduction to the sights and sounds of present-day Israel as well as its rich history. About Marcia Hammond (Author) : Marcia Hammond is a published author. A published credit of Marcia Hammond is Young Explorers in the Land Where Jesus Lived.